The value of a Ontario - 25 cents 1970 stamp depends on several factors such as quality and wear, supply and demand, rarity, finish and more. Values in the section are based on the market, trends, auctions and recognized books, publications and catalogs. This section also includes information on errors and varieties and characteristics. Stamp to commemorate Japan's Expo 70, Asia's first World Exposition. Canada Post Office has prepared 4 commemorative stamps, 3 of which associate the provincial floral emblems with the symbol of Expo 70, a stylized cherry blossom the 5 petals of which symbolize the 5 continents. Centred in the symbol a circle representing the sun of Japan. 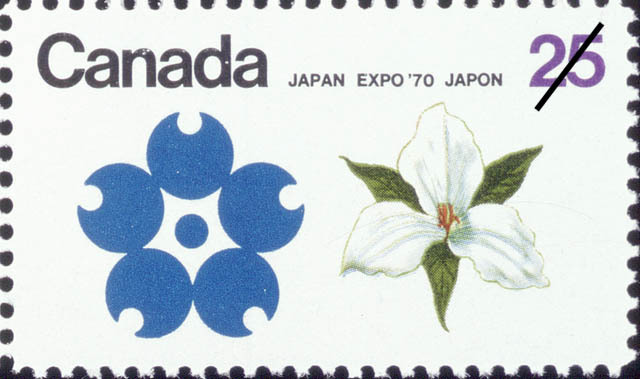 Canada's 4th stamp associates the Expo 70 symbol with that of our Centennial year World Fair in 1967.